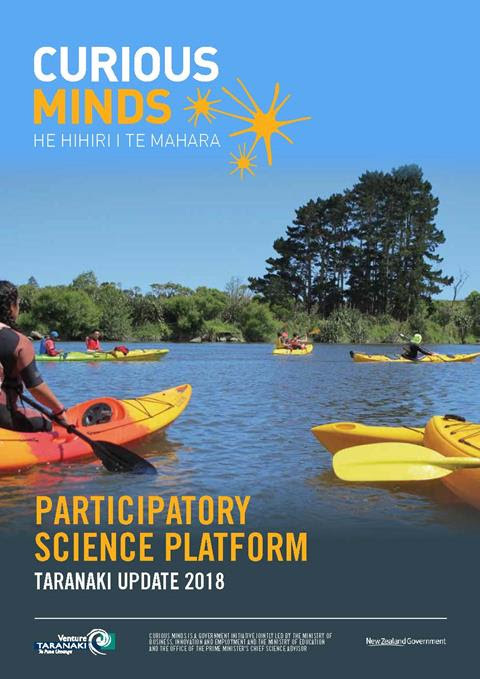 Waterways and MERG have recently published details of a survey methodology for locating and mapping īnanga spawning sites near coastal rivermouths. 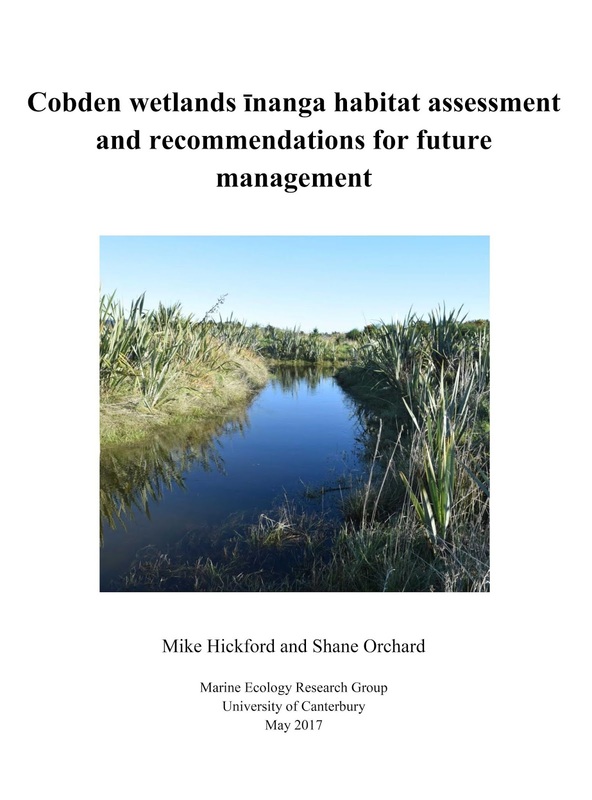 The paper in NZ Journal of Marine and Freshwater Research is available online here. Christchurch City Council (CCC) recently changed its riparian vegetation clearance practices for a trial period in the summer of 2016/17. While the trial has wider objectives around improved environmental outcomes, īnanga spawning habitat is directly affected by bank cutting and other forms of vegetation clearance. A survey of īnanga (Galaxias maculatus) spawning habitat was completed in April 2017 to evaluate effects of the trial. 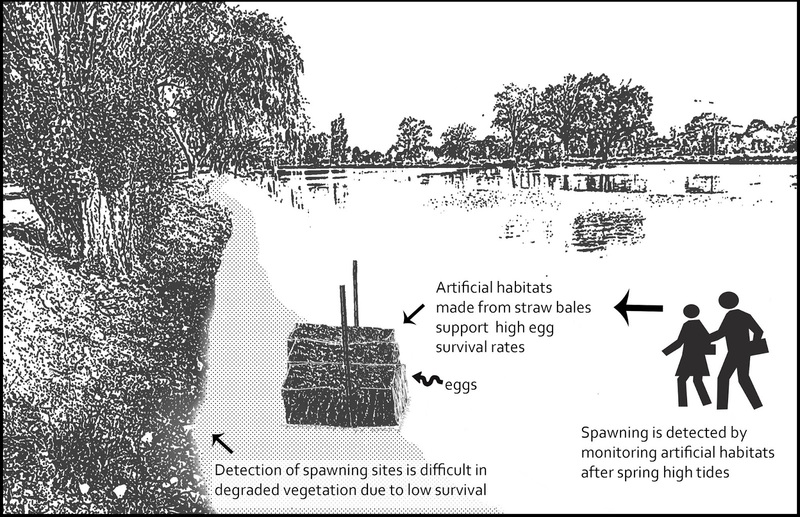 Benefits of the trial included increasing the availability of high quality spawning habitat and the discovery of new spawning sites. The Avon/Ōtākaro supported a relatively high area of occupation (AOO) of spawning sites for a single month in comparison to other years. 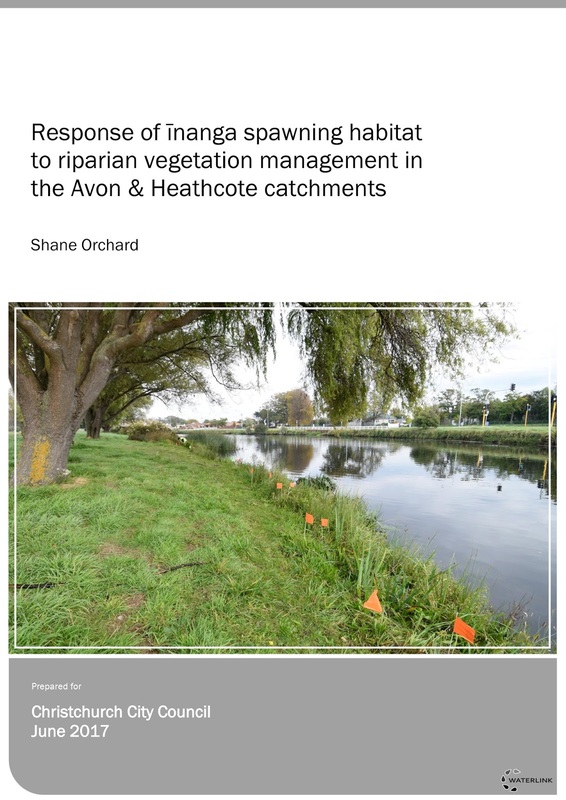 In the Heathcote/Ōpāwaho spawning was found at new sites including upstream of Opawa Road. 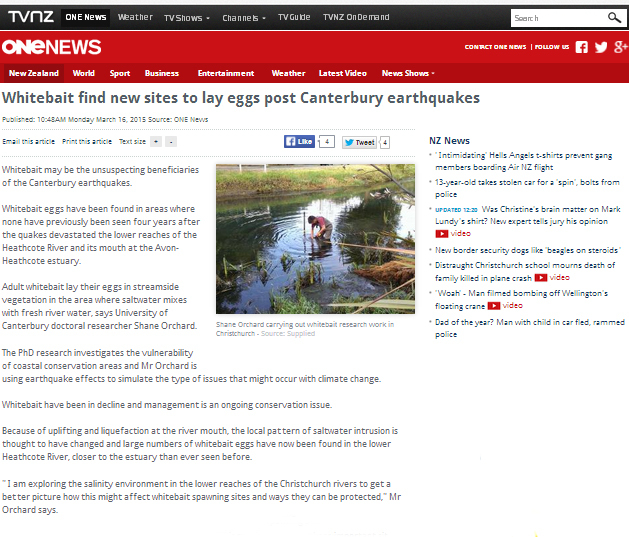 However, egg production was relatively low in the Heathcote/Ōpāwaho versus the same month in previous years. This suggests a shift in the month of peak spawning activity or a possible adult population decline and requires consecutive month surveys to confirm the actual trend. Thanks to the New Zealand Coastal Society for the Best Overall Presentation prize at the 2016 New Zealand Coastal Society conference He Waka Eke Noa: Linking Science, Engineering, Management and Community. I was completely taken by surprise given the many excellent speakers! The conference is held each year and attracts diverse attendance from scientists, engineers, and planners, with presentation covering a wide range of contemporary management topics. 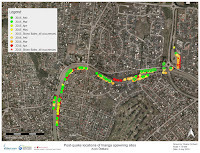 These maps show results from two years of spawning site surveys plus two years of straw bale experiments in the waterways of Ōtautahi Christchurch. 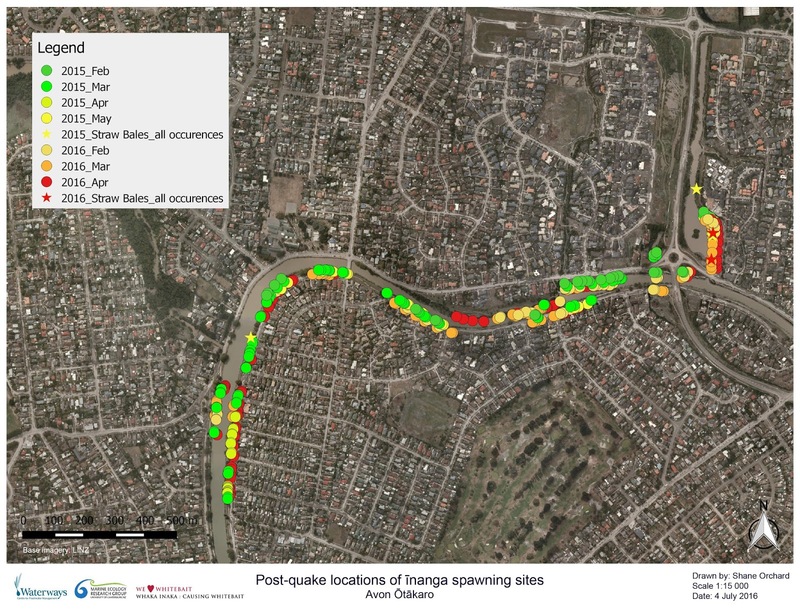 Compare them with the Whaka Inaka maps where we took all of the known sites at the end of 2015 and tested if there might be others both in the gaps and further upstream/downstream. And yes there were. These maps are available as free downloads. There's some other maps available too .. 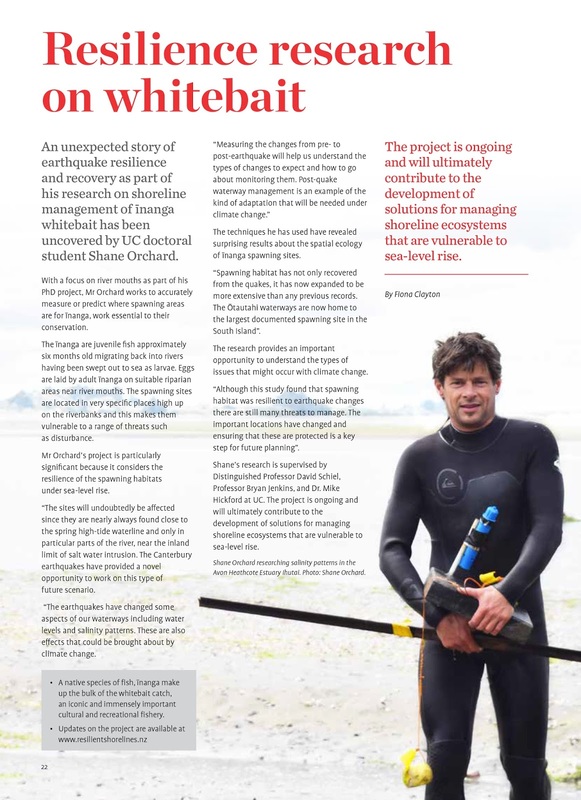 The September 2016 issue of the Chronicle He Kupu Whakamahara ran a story on our research into the resilience of whitebait spawning sites in Ōtautahi Christchurch following the earthquakes. 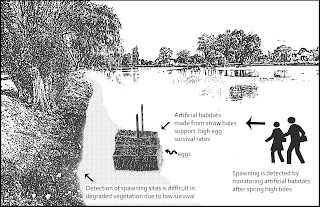 Census survey approach to quantifying īnanga spawning habitat New Zealand Journal of Marine and Freshwater Research, 52(2), 284-294. Earthquake-induced habitat migration Aquatic Conservation: Marine and Freshwater Ecosystems, 2018; 1-11. 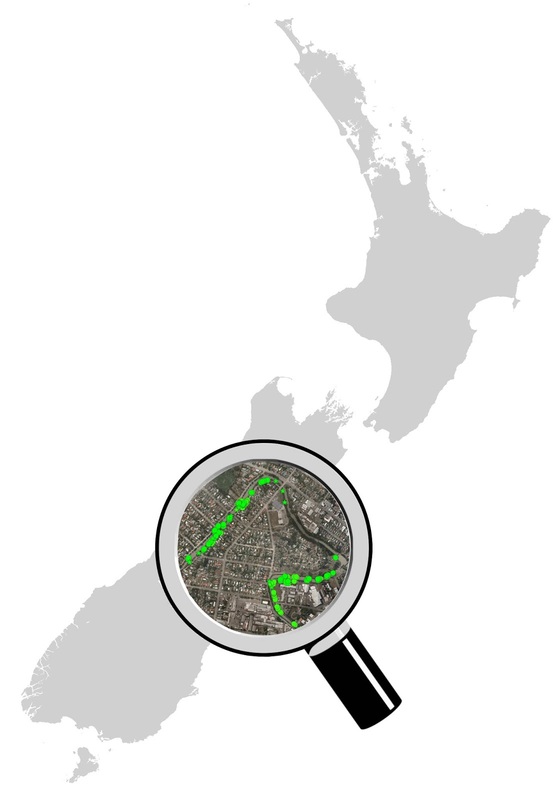 I teamed up with Helen Kettles (DOC) to run a workshop on Coastal & Marine Citizen Science in New Zealand as a side event for the NZ Marine Sciences Society (NZMSS) and Australian Marine Sciences Association (AMSA) 2016 conference in Wellington. This was a first meeting specific to coastal and marine citizen science in New Zealand. A group of 29 participants attended and there was a strong Australian contingent which added a welcome dimension to the conversation. 2015 hottest year on record? This recent information from NOAA is worth a look. It that shows very warm global conditions have prevailed since January. Read more about the trend versus historical averages on the Think Progress site here. 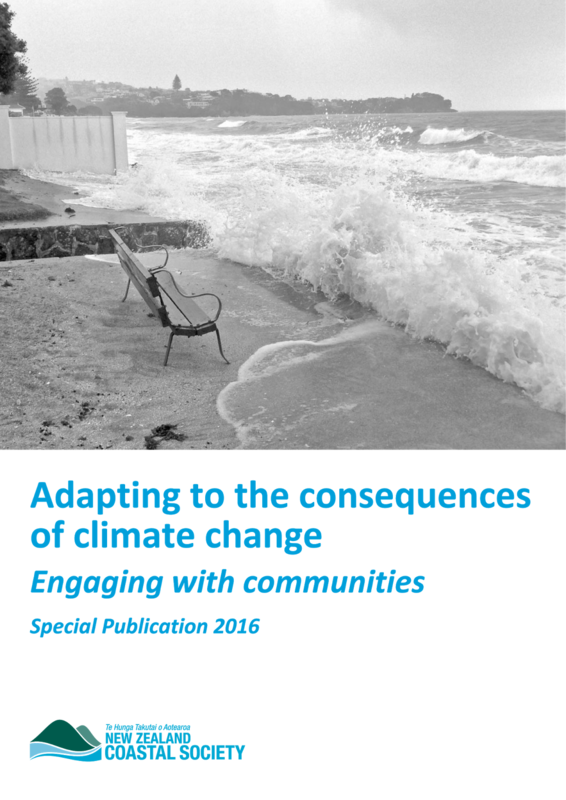 And some recent comment on the 10 things you need to know about climate change with implications for New Zealand. There's a lot going on in the lead-up to the COP21 climate change summit in Paris ... watch this space! 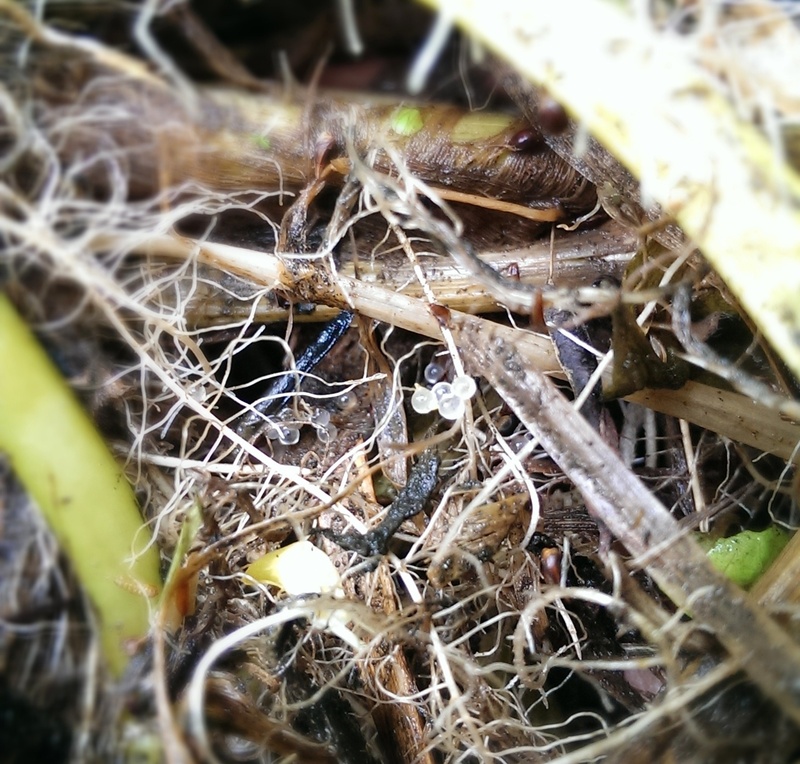 Whaka Inaka: Causing Whitebait is a joint collaboration between EOS Ecology, Ngāi Tahu, and the University of Canterbury (UC). We recently receiving funding from the Department of Conservation Community Fund, and together with support from Brian Mason Trust, and businesses such as Ravensdown the project is getting underway! 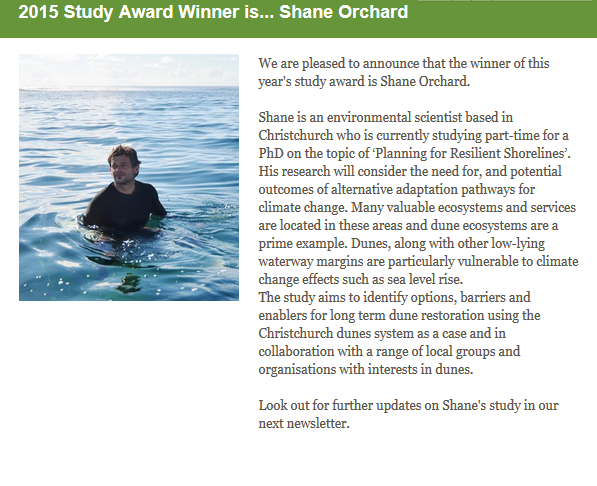 A big thank you to the Dunes Trust for adding their support to our to our dune management case study. Visit www.dunestrust.org.nz for more information on conservation and restoration New Zealand’s dune ecosystems. 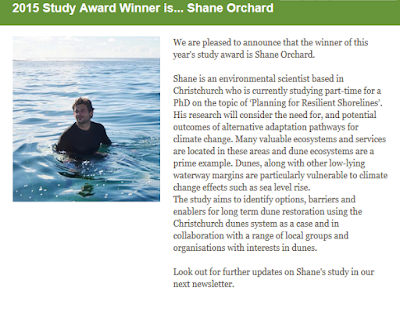 The Resilient Shorelines team would like to thank the Brian Mason Scientific & Technical Trust and also NIWA for bringing their support to this exciting research. An interesting though unexpected finding of this work was the discovery of a leak in the Woolston Tidal Barrage. The model calibration was excellent in the lower estuary and in the Avon / Ōtākaro. However there was a strong anomaly between the modelled versus observed salinity datasets for the Heathcote / Ōpāwaho that have been influenced by the tidal barrage leakage. 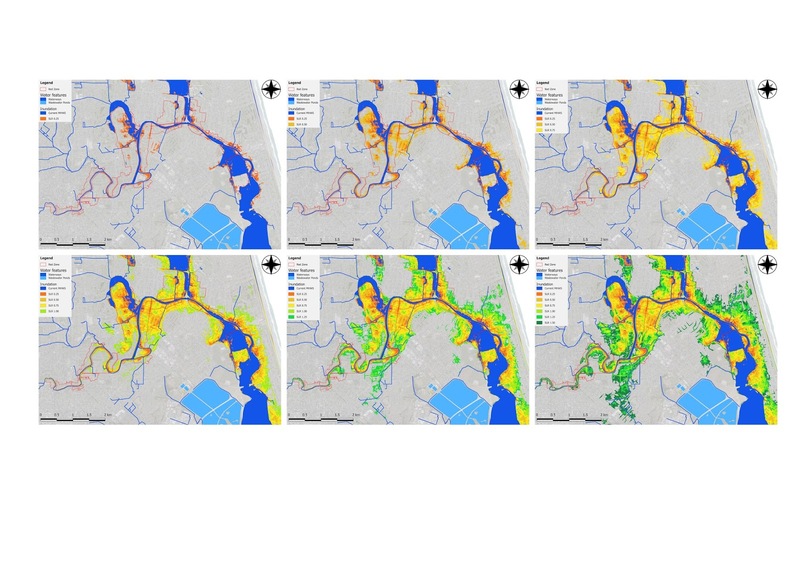 Read more about it here in the Brian Mason Trust report on 'Development of a fine-scale salinity model for the Avon Heathcote Estuary Ihutai'. 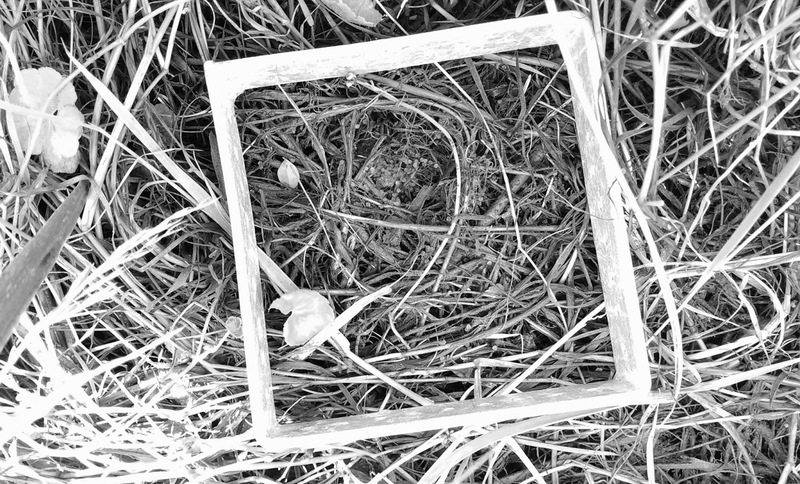 One of the main objectives for our whitebait conservation study was to determine if the earthquakes had altered the location of spawning sites for īnanga (Galaxias maculatus) for spawning. They are typically found in specific locations near the freshwater-saltwater interface at rivermouths. As such, īnanga spawning sites are potentially a very good indicator of change. Conversely, they may be especially vulnerable to changes that affect the availability or condition of suitable habitat. And the answer is - yes, there has been a major shift in the location of spawning compared to all previous records!